The Hinsdale Fire Department is sponsoring an overdose prevention bystander training on April 13. This is a free community session to learn about the signs and symptoms of an opioid overdose, how to use the lifesaving antidote Narcan and learn about community resources. The Graue Mill Flood Protection Improvements Project won the American Public Works Association’s (APWA) local Suburban Branch Project of the Year award in the category of Environmental Projects less than $5M. Metra Board approves locomotive purchase to increase reliability. At the Village Board of Trustees meeting on February 19, 2019 the Board approved a resolution advocating for the closure of the Sterigenics Willowbrook Facility and will file a Motion to Intervene in the Sterigenics motion. Metra is launching two surveys to gain feedback regarding the BNSF schedule and the weekend service. Hinsdale Fire Department hosts free overdose prevention training on Saturday, April 13, 2019. Sterigenics Willowbrook has been shut-down by the EPA until further notice. For additional information, please click here to view the Seal Order. Willowbrook has issued a press release regarding new air sampling results that warrant immediate emergency action to shut down Sterigenics. Please click here to view the press release. 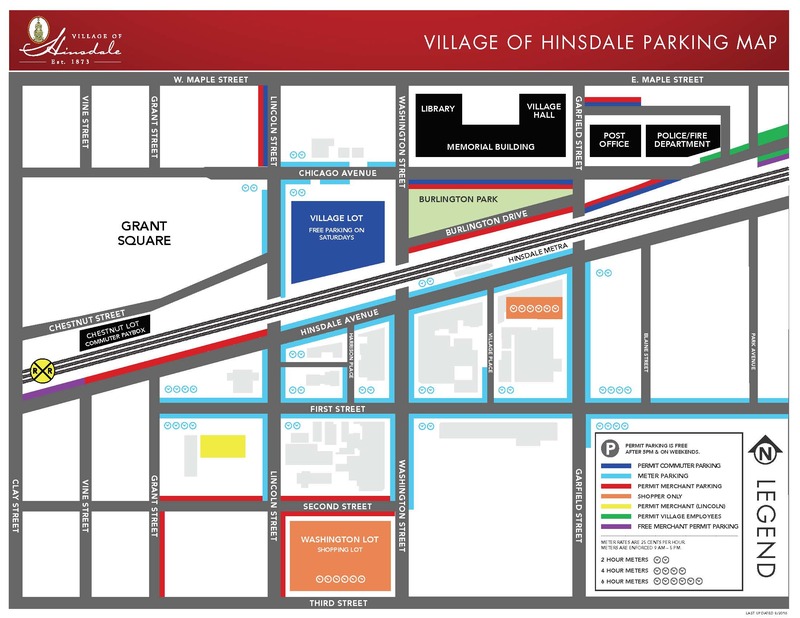 The Village of Hinsdale and District 181 reach understanding on parking deck design. ComEd will be conducting vegetation management throughout the Northside of the Village during the month of March. Please see attached map and postcard for details. The Village stands with United States Representative Lipinski and Illinois House Minority Leader Durkin and other local leaders calling for shut down of Sterigenics. Please click here for more details. The U.S. Environmental Protection Agency held a webinar Tuesday, February 5, 2019 to provide updates on the EPA ethylene oxide monitoring data for Willowbrook. Please click here to view the webinar. Please click here to view the Village’s response to most recent EPA report related to Sterigenics. For more information, click here. The Village’s tree pruning contractor is scheduled to begin tree pruning in the coming weeks. Please click read more for additional details. The Environmental Protection Agency (EPA) will be posting data from ambient ethylene oxide monitoring near the Sterigenics Willowbrook Facility. The Tollway will be conducting tree trimming along the I-294 right-of-way begining in February 2019. This trimming will facilitate the temporary relocation of fiber lines located within the Tollway's right-of-way. Due to the weather, recycling and refuse pick-up will be delayed by one day this week. Monday pick-up will now be Tuesday and Thursday pick-up will now be Friday. Please call Republic Services at 630-964-3232 for more information. Thank you for your patience. Please click here to view a recent article published by the Chicago Tribune regarding Sterigenics. Please click here for additional information. Please click the links below to view letters from President Cauley to Sterigenics and the Enviornmental Protection Agency (EPA). View letter to Sterigenics. View letter to EPA. The Illinois EPA has received the stack test reports for Willowbrook I & II. Illinois EPA is currently reviewing the reports. Click read more to view the reports. Last week, residents received a postcard advising important information regarding the new residental refuse collection program begining in November. Please click here to view the postcard. The United States Census Bureau is hiring for a variety of temporary jobs, including census takers, recruiting assistants, office staff, and supervisory staff. On October 9, 2018, Metra proposed its 2019 operating budget that included a no fare increase for 2019. Click here to read the press release. The Tollway will be conducting a tree survey along portions of I-294 in Hinsdale. Starting on October 22, trees will be tagged and inventoried. Survey work is said to be completed from the Tollway side and should be completed by November 9. Please click here to view maps. The Village of Hinsdale Police and Fire Department's Annual Open House will be held on Saturday, October 13, from 11:00 a.m. to 3:00 p.m. at the Village's Police and Fire Departments. The theme for this year's Open House is "Look. Listen. Learn. Be aware. Fire can happen anywhere". On Friday, October 12, the 24th Annual Silent Parade, which honors all fallen firefighters in the line of duty and any civilian who perished in a fire, kicks off at the Hinsdale Fire Department at approximately 7 p.m. The Hinsdale Fire Department is teaming up with the National Fire Protection Association (NFPA) the official sponsor of Fire Prevention Week™ for more than 90 years to promote this year’s Fire Prevention Week campaign. Illinois EPA has established a Sterigenics webpage that contains current information, a Q & A section, contact information, and other relevant documents and links. Read More. The 2018 Hinsdale Police Citizen's Police Academy is now accepting applications. This program provides the opportunity to learn more about law enforcement and see firsthand how the Hinsdale Police Department operates. The 24th Annual Silent Parade will take place on Friday, October 12, 2018, at 7:00pm. The parade begins in Hinsdale and ends in Lisle. A brief ceremony will be held at the Hinsdale Fire Department to commemorate firefighters and civilians who have lost their lives due to fires. Beginning September 4, Hinsdale Avenue between Clay Street and Monroe Street will be closed. This includes the total closure of the Madison Street and Hinsdale Avenue Intersection. The closure is expected to take place September 4 - October 30 (weather permitting). The Lane from Oak Street to County Line Road is completely closed for construction during the week of August 20, 2018. Please use detour routes when traveling in this area. Due to the road construction in Hinsdale, the Village would like to remind the community to allow additional time for student pick-ups and drop-offs near school zones. The Village of Hinsdale, in cooperation with Republic Services, is offering curbside residential refuse collection services starting November 1, 2018. Please click here to select your service level and here for more information. The Hinsdale Fire Department, in conjunction with the Hinsdale Water Department, will be testing fire hydrants throughout the Village during the upcoming weeks. Residents are urged to slow down when approaching crews working around flowing fire hydrants. As of Monday, August 6, County Line Road between Sixth Street and Chicago Avenue will be closed for construction through Friday, September 14 (weather permitting). No thru traffic for the duration of the construction project. Local traffic will have limited access. The Oak Street Bridge and Chicago Avenue (from Oak Street to County Line Road) will be closed for construction through October. Please remember to use the detour, please click here to view the map. Thank you for your patience. Construction is scheduled to begin in July on local bridges over I-294. Read More. Hinsdale Police are reminding residents to lock their car doors and remove their keys each and every night. Two cars were stolen from residential driveways overnight from Saturday night to Sunday morning this last weekend. Both vehicles were unlocked with keys left inside. Metra has announced they will offer early getaway service on Tuesday, July 3 on most lines to help customers get a jump start on their Fourth of July celebrations. To read the full press release click here. The Annual Independence Day Celebration kicks off at 10:00am on July 4. Read More. The Economic Development Commission is hosting a FREE Yelp 101 seminar on Tuesday, June 26 at 8:30 a.m. Discover what tools can make you most successful in telling your story on your Yelp business page and learn helpful information about the ins-and-outs of online reviews. On June 12, the Hinsdale Village Board recognized several public safety employees who were either promoted or sworn-in. To read the full press release click here. Please click here to view the Tollway's presentation on June 12, 2018, prior to the Village Board meeting regarding the widening of I-294 through Hinsdale. Please click here to view the Roll Map provided. Read More. Uniquely Thursdays starts Thursday June 14, from 6:00 p.m. - 9:00 p.m. in Burlington Park. Read More. A new Metra BNSF Line train schedule will take effect on June 11. This schedule change was necessary due to the implementation of Positive Train Control and also incorporates feedback from the approximately 2,400 customer comments Metra received during the public comment period. Read More. Representatives from the Illinois Tollway Authority have agreed to hold an open house to meet with Hinsdale residents on Tuesday, June 12, at 6:00 p.m. to discuss the Tollway’s plan to widen the Central Tri-State Tollway through Hinsdale. Read More. Metra will be adding additional trains on Friday, June 8, and Saturday, June 9, for Blues Fest and Spring Awakening. Read More. The 45th Annual Hinsdale Fine Arts Festival will be held on Saturday June 9 and Sunday June 10 from 10:00am - 5:00pm in Burlington Park. Read More. The Annual 4th of July parade will be held on Wednesday, July 4, at Burlington Park. Please click here for event details and here for parade entry information. The Hinsdale Public Services Department will be conducting two annual prescribed burns on two natural areas located on Village owned parcels on March 19, 2018. Metra released a proposed weekday schedule revision for the BNSF Line. The BNSF will be the first Metra line to have Positive Train Control operational, but the enhancement will require a revision of the line’s schedule starting this summer. Please read more to provide feedback to Metra. The Illinois State Water Survey and Federal Emergency Management Agency have been working to revise the flood plain mapping documents in DuPage County for a number of years. The major documents being improved are the Flood Insurance Rate Map and the Flood Insurance Study. The Village would like to remind residents to keep exhaust vents, fire hydrants, outdoor natural gas meters and regulators clear of snow and ice so utility workers and first-responders can access them during an emergency, if necessary. The Village has establisted a Snow Plan to combat winter storms while maintaining public safety and preventing damage to life and property. To view the Snow Plan, please click here. Nicor will be continuing its new gas improvement initiative during the month of February. Please click here to read more and learn about affected areas. Please click here to view the Draft FY 2018 - FY 2023 Capital Improvement Plan and here to view the presentation given on January 9, 2018. The Village's tree pruning winter program is scheduled to begin in December. Parkway trees in specific sections of the Village will be pruned during this period. For more information, please click here. The Illinois Tollway is offering an opportunity for you to improve your future travel on the Central Tri-State (I-294) by completing a quick five minute survey about your travel habits along the Central Tri-State corridor. Click here to take the survey. Stop signs have been installed at the intersection of Garfield/Walnut for both northbound and southbound traffic. The intersection is now a four way stop. The Oak Street Bridge Pocket Park Dedication was held on Tuesday, June 13, 2017. Merchants from all shopping areas will have their merchandise available for purchase throughout downtown Hinsdale. In preparation for the Village's Central Business District resurfacing project, the Village is providing free valet service to all customers of the downtown every Saturday in July and August from 10:00 a.m. to 5:00 p.m. The Hinsdale Fire Department will be flow testing fire hydrants in the Village during the upcoming weeks. Residents are urged to slow down when approaching crews working and to exercise caution when approaching standing or flowing water from fire hydrants during this time. Cook County residents, if your home was affected by the severe storms that occured between April and May of 2013 you may be eligible to receive assistance with home repairs. Read More. At the Village Board of Trustees meeting on Tuesday, May 2, 2017, a preliminary draft of the Accelerated Roadway Plan was presented. Click here to view the draft preliminary presentation. On 4/27/17, the Illinois Tollway Authority voted on its $4 billion plan to reconstruct and potentially widen I-294. The Illinois Tollway Authority announced they will be hosting a series of open houses to inform the public and gather input about I-294 reconstruction. Click here to view the Open House Presentation from April 24, 2017. Spring is here and Republic Services will be picking up yard waste. Please be advised, as of May 1, 2017, yard waste stickers will increase to $3.25. ComEd intends to perform vegetation management activities on distribution circuits in Hinsdale during the time period of May 2017. The TollwayAuthority’s Customer Service and Planning Committee meeting scheduled for Monday, April 17, 2017, has been rescheduled to take place on Monday, April 24, 2017, at 2:30 p.m. at the Tollway Headquarters located at 2700 Ogden Ave., Downers Grove. Hinsdale's Independence Day Celebration will be held at Burlington Park, 19 E. Chicago Ave. on Tuesday, July 4th. Hinsdale residents and officials question need for widening I-294, seek commitment to transparency from Illinois Tollway Authority at committee meeting this week. The Hinsdale Police Department is scheduled for an on-site assessment as part of a program to achieve accreditation by verifying it meets professional standards. The Hinsdale Public Services Department has scheduled two prescribed burns on two natural areas located on Village owned parcels on March 23, 2017. Timing of prescribed burns is sensitive and must be performed before native plants begin actively growing. The Hinsdale Police Department will have new lobby hours starting Monday, March 20, 2017. On 3/7/17, a subcontractor of Nicor bored through a large AT&T duct bank, damaging it. Potentially, 700 customers will be affected. To repair this work, Lincoln Street will be closed from First to Second Street until further notice. On March 8 no parking will be allowed on Chicago Avenue between Washington Street and Garfield Street due to tree pruning. The Village was notified March 3, 2017, by BNSF Railroad that there will be late night track construction (welding) taking place during the second week of March. The Village of Hinsdale held a community information meeting on Monday, February 27, 2017, at 7:00 p.m. regarding the Illinois Tollway Authority’s proposal to widen I-294. The Village Board has requested public comment on a parking garage that is being proposed for the Village's Central Business District. Provide a comment via email. The Hinsdale Police Department is sharing an alert from the Western Springs Police Department. An alleged aggravated vehicular hijacking incident occurred outside of a private residence located in the 4800 block of Fair Elms Avenue in Western Springs the evening of Thursday, February 9. As part of the Illinois Tollway's Move Illinois program, the Tollway is in the planning stages of major work on I-294 through Hinsdale. At the December 12 Village Board meeting, Village Trustees recognized two of Hinsdale’s police officers who were credited with saving a person’s life. Sergeant Mark Wodka and Officer Carter Sward received the Hinsdale Police Department’s Lifesaving Award. The Village of Hinsdale Police Department will be re-instituting its “Stop Means Stop” enforcement campaign. The ultimate goal of the program is to change motorists' behavior when stopping or yielding at an intersection. The Village of Hinsdale will be conducting its annual prescribed burns at two locations on Wednesday (3/27/19). The two locations are the Charleston Road Aquatic Garden and the Hinsdale Prairie. Please click here for details.